The nouveau driver is what killed me. I forgot the steps I took last time for nvidia; obviously missed one. But nouveau needs to be purged and blacklisted first. Or is there another way to see at a glance if the connection is alive while in the fluxbox GUI? You could probably do that in conky with the if_up variable. Since VSIDO is configured to set the ethernet as eth0 or wlan0 and not the new enpxxx wlpxxx nomencalture a user could set up the conkyrc to display something like ETH0: up/down speeds, or Wlan0: up/down speeds. Probably find one ready made in the BL conky thread. Edit - that was easier than I thought; just change the config to the correct interface name(s). This conkyrc is set with "if_up_strictness = address", options are up, link, address. So only the interface that is actually getting an ip address is showing. During the new install, I used the legacy BIOS iso (uEFI iso on the first one) and the installer kept crashing - 3 tries. Crashes at the end of the disk partioning section, or right afterwards when it's suppose to start uncompressing the image. I think I cropped one of those; Meoto Iwa if you want to search for more. Seems to be a grub/lvmetad issue. Is that on UEFI or regular BIOS? 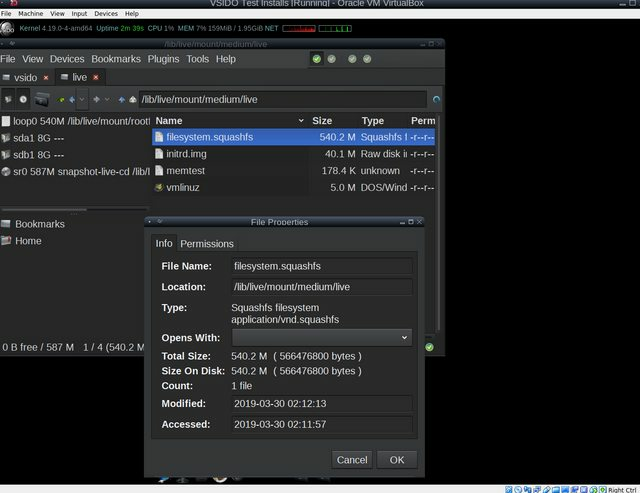 /lib/live/mount/medium/live/filesystem.squashfswhile the 20th March one does not (thus the crash --> installer can't find the image to extract/unsquash). I also confirmed that the filesystem.squash is there by using the old installer and succeeding.. I ran the non gui installer version of it and it installed fine..
Is it possible that the linstaller updates I applied failed on this build? Regarding udev thing, looks to me it's either due to lvm, udev or grub itself.